Property Location Centrally located in Nanuet, Comfort Inn & Suites Nanuet is convenient to Palisades Center and Rockland Center for the Arts. This hotel is within close proximity of Blue Hill Golf Course and St. Paul&apos;s Episcopal Church.Rooms Make yourself at home in one of the 150 air-conditioned guestrooms. Complimentary wired and wireless Internet access keeps you connected, and satellite programming provides entertainment. 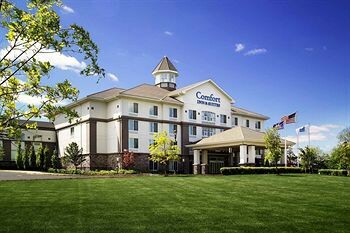 Conveniences include desks and coffee/tea makers, as well as phones with free local calls.Rec, Spa, Premium Amenities Be sure to enjoy recreational amenities including an indoor pool and a fitness center.Dining Enjoy a satisfying meal at a restaurant serving guests of Comfort Inn & Suites Nanuet. Quench your thirst with your favorite drink at a bar/lounge.Business, Other Amenities Featured amenities include a business center, complimentary newspapers in the lobby, and a 24-hour front desk. Event facilities at this hotel consist of conference space and meeting rooms. Free self parking is available onsite.